Hidden in the beautiful Red River Valley of North Texas, Rancho Sereno is a 165 acre private ranch and wildlife preserve. 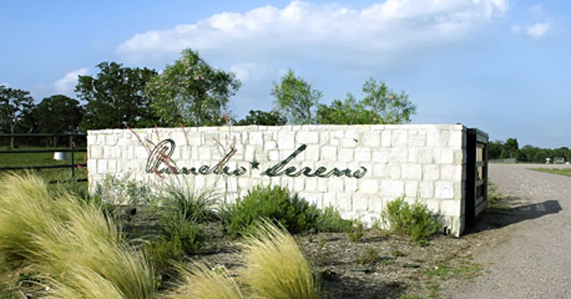 Rancho Sereno is primarily a successful breeder of performance horses. Hover over the thumbnails on the right of this page to view our mares, weanlings, yearlings and two year olds. Located on the ranch is the Guest House overlooking native prairie, indigenous hardwoods and a five acre lake stocked with bass. The Guest House is designed in contemporary Texas vernacular style with an expansive patio shaded by a handsome pergola and beautiful views of the surrounding country. The interiors were created by a recognized San Francisco design firm with a level of sophistication not usually found in a property of this size. Located approximately 1 hour from the Dallas Fort Worth metroplex and 10 minutes from Lake Texoma, the Guest House is in the heart of horse country within minutes of the most recognized trainers and breeders of quarter horses in the United States. The Guest House is the perfect spot for a weekend retreat with family and friends and an elegant headquarters for horse owners and professionals visiting the area.